Justice Department officials announced five federal charges against Cesar Sayoc, 56, of Aventura. Cesar Sayoc had a criminal history and a fervor for President Donald Trump. FBI officials did not disclose a motive, although AG Jeff Sessions suggested politics may have played a role. 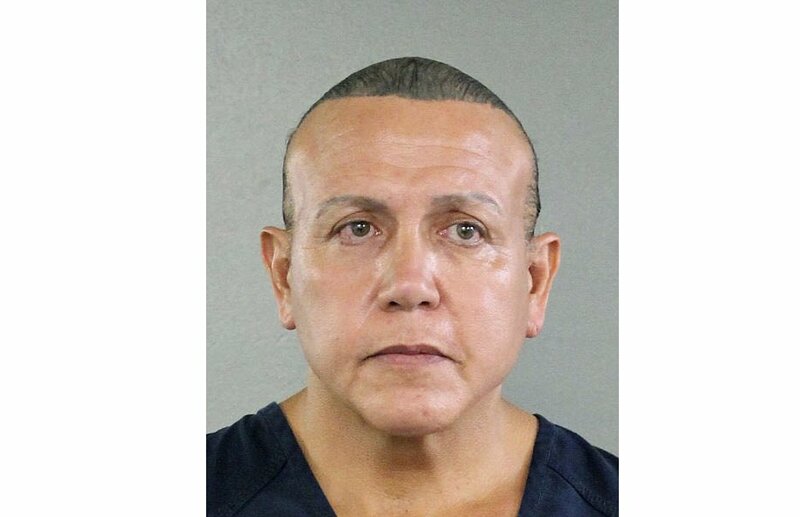 Federal authorities on Friday captured a Florida man with a criminal history and a fervor for President Donald Trump and accused him of sending at least 13 mail bombs to prominent Democrats, capping a nationwide search in a case that spread fear of election-season violence with little precedent in the U.S.
Justice Department officials announced five federal charges against Cesar Sayoc, 56, of Aventura, Florida, and revealed that DNA and a fingerprint found on an envelope package helped them identify the suspect after a five-day, coast-to-coast investigation. Even as he was arrested and charged, investigators scrutinized new suspicious packages believed to be tied to his plot. 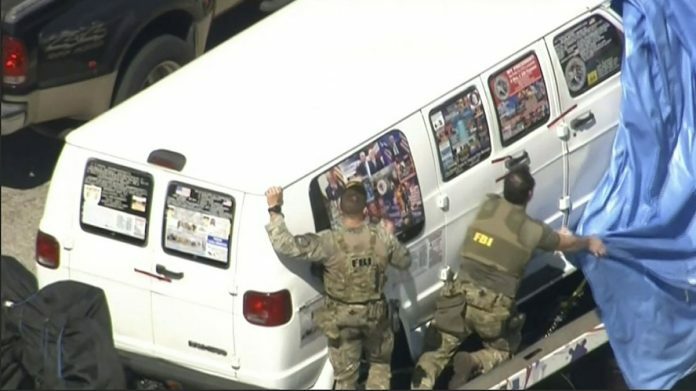 FBI officials did not disclose a motive, although Attorney General Jeff Sessions suggested politics may have played a role, noting Sayoc appeared to be a “partisan.” Those who saw him in the neighborhood, unmistakable in a white van plastered with Trump’s image and political stickers, described him as unsettling and troubled. Sayoc’s social media profiles portray a deeply disaffected conservative who trafficked in online conspiracy theories, parody accounts and name-calling. He called a Florida school shooting survivor a “fake phony,” peddled theories about George Soros, the billionaire political donor targeted this week by a package bomb and denigrated other Democrats who were later the intended recipients of explosive packages. He appeared to be to living in his van, showering on the beach or at a local fitness center. Sayoc’s arrest Friday was a major breakthrough in the nationwide manhunt following the discovery of explosive devices — none of which detonated — addressed to prominent Democrats and other frequent targets of conservative ire, including former President Barack Obama, former Vice President Joe Biden, Hillary Clinton and the cable network CNN. On Friday, new packages addressed to New Jersey Sen. Cory Booker and former National Intelligence Director James Clapper were intercepted — both similar to those containing pipe bombs discovered earlier in the week. Investigators in California scrutinized a package sent to Democratic Sen. Kamala Harris, her office said, and one sent to Tom Steyer, a billionaire businessman who has campaigned for months for Trump’s impeachment. The mail bombs, coming barely a week before major midterm elections, sparked a heated national conversation about the hard-edged political climate and Trump’s role in fanning the flames. The president has branded the media the “enemy of the people” and hurled harsh, personal insults at others targeted in the plot. Speaking later to reporters Friday evening before leaving for a political rally in North Carolina, said he knows Sayoc supported him but that he himself “bears no blame.” Hours earlier Trump had complained via tweet that “this ‘bomb’ stuff” was taking attention away from the upcoming election and that critics were wrongly blaming him. The big break came when a fingerprint found on one of the packages, intended for California Rep. Maxine Waters, matched a fingerprint of Sayoc’s on file with Florida authorities. A DNA sample from a device intended for Obama similarly matched the suspect’s DNA, the FBI said. Some packages included photographs of the intended recipients marked with a red “x,” the FBI said. The packages contained timers and batteries, but were not rigged to explode upon opening. Officials were uncertain whether the devices were poorly designed or never intended to cause physical harm. “These are not hoax devices,” FBI Director Chris Wray said. Sayoc had $4,175 in personal property and more than $21,000 in debts when filed for bankruptcy in 2012. “Debtor lives with mother, owns no furniture,” his lawyer indicated in a property list. Sayoc’s political awakening appears to have coincided with Trump’s rise. He registered to vote in Florida in March 2016 and has voted early since, records show. Documents released Friday by the Broward County Sheriff’s Office show Sayoc reported in May 2015 that more than $40,000 in goods were stolen from his van and an attached trailer, including 11 pieces of Donald Trump-brand clothing valued at $7,150. Specifics are not included, but Trump has a line of suits, shirts, ties and accessories. Most of those targeted this week were past or present U.S. officials, but packages also were sent to actor Robert De Niro and billionaire George Soros. The bombs have been sent across the country — from New York, Delaware and Washington, D.C., to Florida and California, where Waters was targeted. They bore the return address of Florida Rep. Debbie Wasserman Schultz, the former chairwoman of the Democratic National Committee.